Acute stress disorder treatment options. 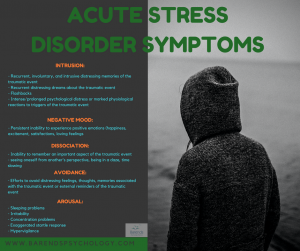 Despite the fact that someone cannot suffer from acute stress disorder (ASD) for longer than a month, acute stress disorder treatment is very important in terms of ASD symptom reduction ,,,, improving the quality of life , and prevention of the development of PTSD ,. Unfortunately, not all acute stress disorder treatment options are effective; medication, for instance, is not effective in the treatment of ASD ,, and psychoanalysis has failed to show its effectiveness in treating ASD for decades. This article discusses common and effective acute stress disorder treatment options and explains how they work. This article is updated on a regular basis. Effective acute stress disorder treatment options – psychotherapy. 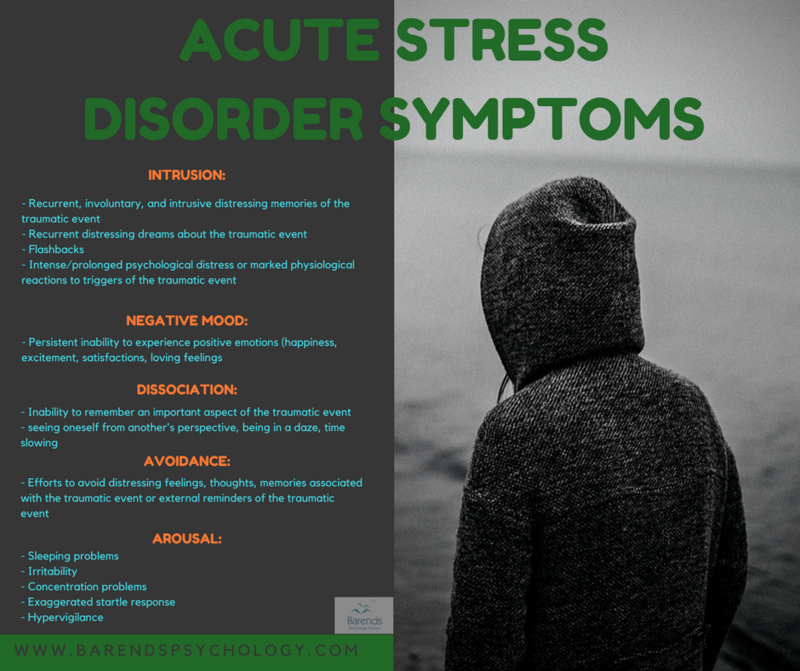 Acute stress disorder (ASD), also known as shock, is a common response in reaction to experiencing traumatic events; approximately one in every five people develop ASD . The ASD symptoms make it difficult for people with ASD to enjoy life and/or to perform at work or at other activities. Psychotherapy focuses on the reduction of the ASD symptoms and on coping mechanisms to deal with ASD related distress. As research suggests, receiving psychotherapy for ASD soon after the traumatic event improves the adolescent trauma survivors’ quality of life significantly . On top of that, psychotherapies, such as Cognitive Behavioural Therapy (CBT), CBT-hypnosis and exposure in vivo, significantly reduce posttraumatic stress symptoms ,. Early trauma-focused cognitive-behavioural therapy (TFCBT) can even prevent complex PTSD in people diagnosed with ASD , and is successful in treating ASD ,. Eye Movement Desensitization and Reprocessing (EMDR) is as effective as CBT and exposure in vivo ,. What is the difference between these therapies? Exposure in vivo focuses on the controlled (and sometimes gradual) exposure to the feared objects/thoughts/situations. Someone with ASD may find it difficult to be reminded of the traumatic event and, therefore, (subconsciously) avoids reminders of the traumatic event. Unfortunately, avoiding reminders, memories or thoughts of the traumatic events is counter-effective in processing the traumatic event correctly. With exposure in vivo, the patient learns that these reminders, thoughts and memories are not dangerous or life threatening. During the therapy, the ASD symptoms significantly reduce or disappear. EMDR focuses on processing distressing memories and beliefs by offering bilateral stimulation while the patient is being exposed (imaginary) to the traumatic event. Research shows that by applying EMDR the distressing memories and beliefs are processed correctly. The negative feelings, emotions and memories attached to the traumatic event are being neutralized which significantly reduces the ASD symptoms. CBT focuses on the development of personal coping strategies that target solving current problems and changing unhelpful patterns in cognitions (e.g. thoughts, beliefs, and attitudes), behaviors, and emotional regulation. The patient learns to stop avoiding ASD related thoughts, feelings, memories, and emotions, which results in the reduction of ASD symptoms. CBT-hypnosis is a combination of the above mentioned CBT and hypnosis, which may result in deep relaxation, identifying deeper lying beliefs and attitudes, and enhances imagery. TFCBT focuses on reprocessing the traumatic event by writing about it and applying cognitive restructuring on certain beliefs and attitudes. SWT is almost the same as TFCBT. More research is needed to be able to say more about its effectiveness, but the preliminary results are promising. (Advertisement. For more information about ASD treatment, please scroll down). Effective acute stress disorder treatment options – medication. Medication does not significantly reduce acute stress disorder symptoms and therefore are not recommended as a first line treatment for ASD ,. Two meta analysis studies found no significant effect of pharmaceutical drugs on the reduction of acute stress disorder symptoms ,. If ASD turns into PTSD, however, medication in the form of SSRIs, may help reduce PTSD symptoms in the DSM-IV PTSD symptom groups: reexperiencing, avoidance/numbing, hyperarousal ,. Ursano, R. J., Bell, C., Eth, S., Friedman, M., Norwood, A., Pfefferbaum, B., … & Charles, S. C. (2004). Practice guideline for the treatment of patients with acute stress disorder and posttraumatic stress disorder. Am J Psychiatry, 161(11 Suppl), 3-31. Davidson, J. R. (2006). Pharmacologic treatment of acute and chronic stress following trauma: 2006. J Clin Psychiatry, 67(Suppl 2), 34-9.